Support TPT by becoming a volunteer! Here at TPT, we know volunteers are crucial to our success. We have relied upon the energies, passion, and talent of volunteers since the beginning. We would not be who we are, or do what we do, without people like you who want to contribute their invaluable resources of time, talent, and caring. If you’re interested in joining our team and supporting the important programming we do, Click here to see what our current needs are! Second Saturdays: Every month, TPT hosts kid-centered activities and often brings various PBS characters to life! Enjoy helping families make memories. Pledge Drives: Four times a year our studios become centers of action as our volunteers answer calls from our audience pledging their support and helping make our programming possible. Often times, you will be live on camera. Events: From screenings to concerts, private rentals to art shows, and everything in between, our volunteers are essential to making sure visitors have a positive experience at TPT. Office: Our volunteers mail out membership renewals, invitations, and pledge gifts. They make sure no one is left out! 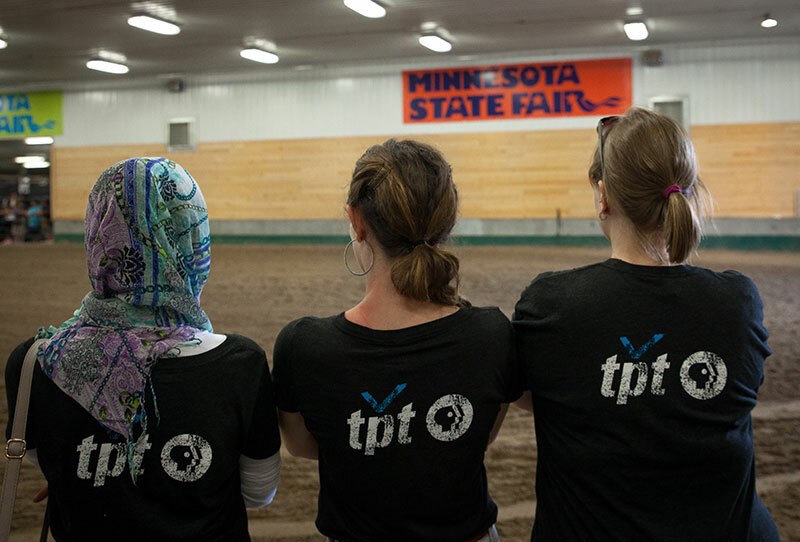 State Fair: TPT has their own booth and it takes a lot of volunteers to ensure it is powered at all times. Volunteers enjoy free admission to the State Fair and the opportunity to mingle with staff and characters like Cat in the Hat and Clifford! LOOKING FOR CORPORATE/GROUP VOLUNTEER OPPORTUNITIES? We have several! Contact Samantha at [email protected] to find out more. Volunteer with your friends, coworkers, and family- we love groups! Enjoy an annual Volunteer Appreciation Party where we celebrate our most important asset- you! Already a Volunteer? Click here to see the latest opportunities. If you would like to volunteer or want more information, fill out the form below and we’ll get back to you. Contact Samantha Grangaard at (651) 229-1443 or [email protected].